I’ve always had a bike; from as far back as I can remember. Hand-me-downs, the Schwinn upright 3-speed, a garage-sale find Azuki Gran Sports, and my first “real” bike – a Trek 560 with Suntour Cyclone in 1984. I cut my mechanic teeth on that Azuki, reading the at-the-time Barnett’s manual cover-to-cover. Various seeds were planted along the way – seeing my first race first-hand in Granite Falls, WA; a slide show from my high school biology teacher on the cycling trip he took down the west coast. Running injuries early in college forced me into the swimming pool, where I was encouraged to get a bike (I suspect they were trying to get rid of me), and that landed me into the world of triathlon. That was the time of my life where I became enamored with the bike as a machine. I did my first triathlon in 1984, and spent 5 of my 6 college years as well as several after racing as much as I could. We did a lot of crazy things in that era; all in the name of eking a little more speed out of the bike. But I noticed something about all that fiddling – while we got faster, the bikes got scarier. I spent many years racing, training, and tinkering. I was a “good” Cat 3, TT’s and climbing being my forte. My team role for crits and flat-ish road races was first lead-out, but for stage races and road races with significant climbing, I was the lead. My typical year consisted of some 60+ events, from road to track and some off-road. In those years I went through several bikes, including three custom Softrides (which I still have). I was always my own mechanic, and became essentially the team mechanic by default – I was the only one with the tools and knowledge to do the job. In 1997 I hung up the bike to put time into a business venture, alongside my full-time engineering job. The business fizzled (or more that the sleep deprivation took its toll on me), and I stepped aside in late 2003. I re-entered triathlon in 2004, an out-of-shape ex-racer… Since then, I’ve found myself a little too physically delicate for the run training, and swimming is just a little too inconvenient compared with grabbing a bike and heading out my front door. This is a much shorter story, though it ties in with the above. My history in triathlon told me there was something amiss with all that tinkering on a road bike – it wasn’t suited to the rider position. When I re-entered the triathlon world, I started studying bike geometry – what made them handle the way they did. I learned, absorbed, and found that the industry as a whole completely missed the boat on a stable triathlon bike design. This was where the first seedlings of framebuilding were germinated. I wanted something better. Fortunately, or maybe unfortunately, I found a used titanium frame with just enough of the right stuff to fit my position. 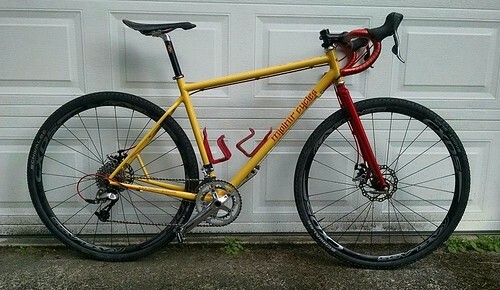 Rumor has it the frame was custom made by Quintana Roo for Scott Tinley. Mind you, Scott is about 3” taller than me, but the top tube was low enough that it worked. I think all this did was put off the torch into the future, though. But I still had that bug. 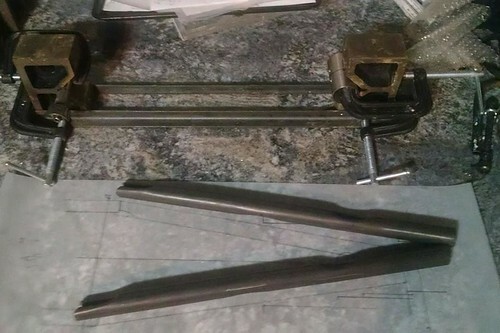 Landing side jobs as a mechanic at a couple local bike shops, I was still pulled to make frames. 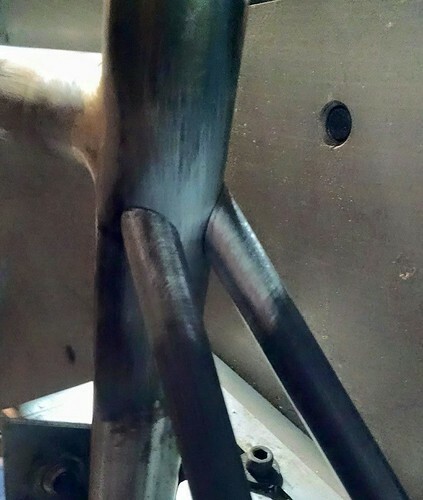 It was just two short years ago, in 2013, that I made my first frame with Dave Levy of TiCycles Fabrication, in an intensive three day one-on-one learning experience. While the result was a frame that was the most stable-riding bike I’ve ever been on (my exact goal), going through the process taught me a valuable lesson – while I had learned a lot about bike geometry and design, I didn’t know jack about actually MAKING frames. And so I delved into the world of fabrication. Leaning mostly on sites like this one right here – I can’t stress enough the gold that’s contained on the free-sharing of information and help on Velocipede Salon. Loads of practice brazing, and finally my first complete builds. My scrap heap is fair, and still grows with pieces I deem not worthy to finish. My frames so far have been builds for myself, family and friends; along with a donation to a youth triathlon team I help coach. Road bikes, gravel bikes, triathlon bikes, and one MTB (which I don’t care to do again). I haven’t really hung out my shingle yet, and I don’t necessarily see framebuilding as something I will do full time as my only source of income. At this point in my life it would more likely be a supplement for an early retirement from engineering and an outlet for my passion. I think everyone, at some point, realizes they want to leave some kind of lasting positive mark on the world. Aside from bringing up my daughters to be well-adjusted and productive members of society, I see the frames I make as part of that lasting mark. 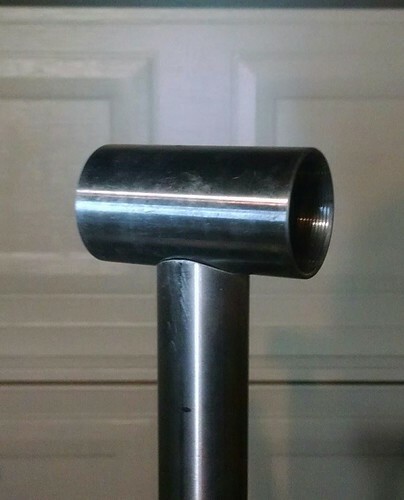 I named my framebuilding venture Mjolnir Cycles – Mjolnir being the name of Thor’s hammer. Yes, I’m Norwegian (3/4 anyway, the rest being a mix of English and Scot). My logo, also tattooed on my back, is in homage to my family, my heritage, and my faith. 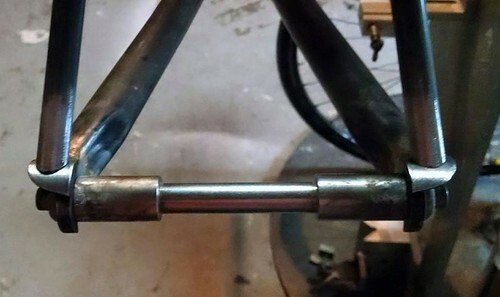 I build in fillet-brazed steel, the only lugs I care to use being some fork crowns. I do drop-bar bikes and their variations – road, ‘cross, all-road, track, and triathlon. I don’t do touring rigs, MTBs, or transportation-solution bikes. I want to keep my focus fairly narrow. Every frame is made specific to the rider – their fit and feel. I don’t claim to be a master, but I do understand the continuum of stable/sluggish to nimble/twitchy, and what contributes to these characteristics, and fitting the bike to the rider. I see the rider and bike together as one unit, the bike essentially disappears under the rider as a separate thing, and the two become one whole. I strive to make the bike that complements the rider such that it disappears. It is not ornate, it doesn’t distract, it doesn’t endeavor to be its own entity. Its meaning is in the ride. One thing I add to all my frames is a Runic spelling (phonetically) of the Norwegian word “verdig” on the top tube. It’s a play on Marvel Comic’s inscription on Mjolnir -- “Whosoever holds this hammer, if he be worthy, shall possess the power of Thor.” The word “verdig” means “worthy”. It’s there to remind the rider, when they’re hanging their head and about to give up, that they’re worthy – of the battle, of the quest, of the effort. I currently build out of my garage, an oxy/propane system, a flat surface and Nortac frame and fork jigs, lots of V-blocks and a whipping post. No lathe or mill – just a bench grinder, drill press and files. I look at each frame I build as a work to be worthy of carrying the name Mjolnir. A venerable and formidable moniker. So my development as a framebuilder will be documented right here on this board. It should be a fun ride. --- you are a success in ronnie's smile..
your goals, maturity, respect within and outside -- set you apart..
but what kindles my fire from within is your humble understanding, as a many decades back song i remember, is so apropos --- "walk, don't run.."
may your run's be righteous after your many awesome stumble-walks.. Fantastic David. Truly appreciate what you are doing and will enjoy seeing the process evolve. Let me start with a little prodding. What do you see from this in 5 and 10 years? Quick comment - think about offering a pronunciation guide (how do you say "Mjolnir"?) right upfront on your marketing materials (even if it's just your webpage). It's on the opening page of the website, but adding it to any other promotional stuff is a good idea - thanks! Hey Johnathan, thanks for the prods! Yeah, good questions on the long-range vision. This isn't something I see as wanting to grow into a production line type of deal and sell to a CannonTrekalized in the future. I fully plan on keeping it a one-man operation for the duration. I know my processes will get more efficient, but I'll be fitting it around a 9-5 (okay, a 6-3) meaning rates will be slowish. And with an 18- month-old, I'm kinda tied to the engineering gig for a while. If all goes well I see being at a decent rate in that 5-10 year time frame that might enable this to supplement an exit from the corporate treadmill. Does that answer your question? ^^What that guy said. Let's see some bikes!! I really like your brand with the story behind it. I also like to see that I'm not alone to work a "coroporate" job to keep the dream alive. Keep it up, you're doing well. Welcome Dave and thanks for sharing your history. Welcome here. If you get to the point where your book remains steady at 8-10 per year, you are in fact pretty solidly building and gaining real experience. Not that you could live on it, but it will be taking a very significant amount of your time. I surely don't see that as a bad thing, just sayin'. So if at that point, you can grow your book enough to put out double that ... then you are to the point where you can be full time assuming you have structured your pricing properly. I'd love to see that some day. Just go at it steady like. And good luck. first off props on the name- Mjölnir is pretty bad a$$. I'm a huge Thor and the Warriors Three fan. I'm always interested in knowing where builders inspirations are derived and how they intern translate them into their own work. I think you have a great start here, and I'm interested to see you start developing your voice. Some pictures of completed builds. First, my wife's all-road. My first build after LOADS of practice brazing. I figured if I wanted her buy-in on this venture, making hers first would be the best way. 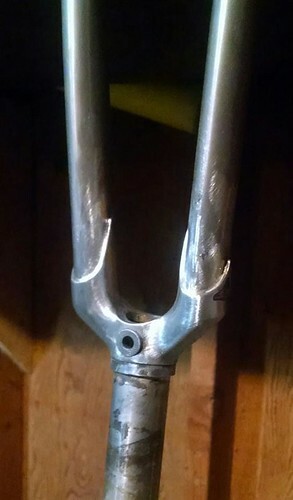 This is prior to steerer and bar trimming. 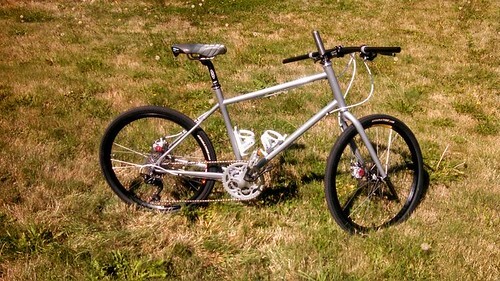 Built on 24" wheels (she's all of 5'3"), 1x10 drivetrain (front shifting has always been her issue), and disc brakes. Road bike made for the youth triathlon team I help coach. Their emphasis is on draft-legal tri, so road bikes are their mainstay. Built on 650c wheels, as most of them are rather short (I measured several of their bikes), and gives them a true racing position instead of having sky-high bars to get over a 700c wheel. 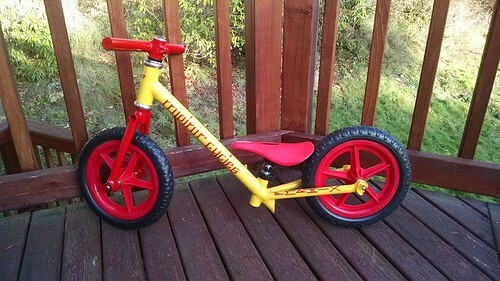 A kick-bike for my daughter, I pushed it to get it finished by this past Christmas. The paint scheme on my daughter's bike was specific to match the gravel bike I made for myself. Fehu: Abundance, hope and plenty. Ehwaz: Movement and change for the better. Raidho: Journey, evolution, change of place or setting. Dagaz: Change of direction by one's will, transformation. Gebo: Gifts of sacrifice and generosity. 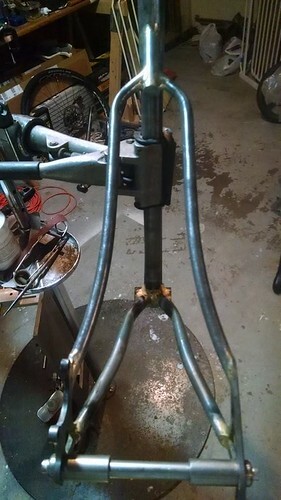 Road frame, first under a new process -- brazing the chainstays to the BB first. Acoustic in front, non-acoustic in back. Finishing up a gravel build. Not a hammer, but it will get hammered. Seatstays at the seat tube. Took me a while to get them just so. And at the dropouts. Note: that gap under the left seatstay was due to it being nudged backwards a tiny bit. That was closed up before the brazing happened. I like the chainstay dimples at the dropout- sweet move!